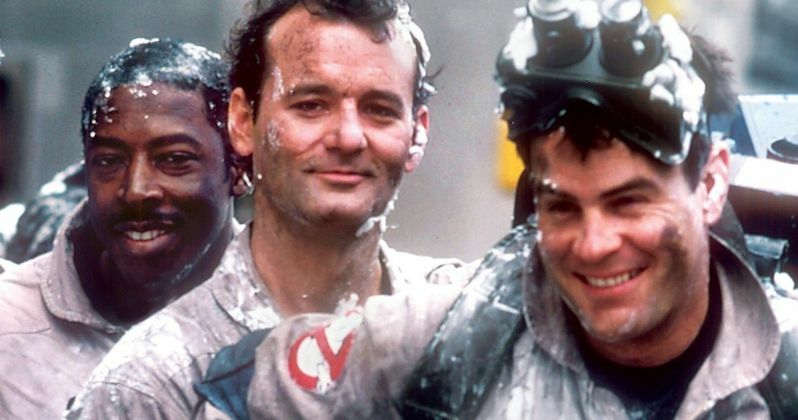 An original cast reunion for Ghostbusters 3 is a possibility, according to Dan Aykroyd. The actor was recently interviewed, and stated that the long-awaited sequel is currently being written. This project has been talked about for over twenty years, so it would be awesome to see the surviving cast get back together again for another Ghostbusters project. The sequel has been held up more than once, with Bill Murray reluctant to hop on board. Hopes for the movie were lost when Harold Ramis got sick, and later passed away. In a new interview with Dan Rather, Dan Aykroyd was asked about the possibility of Ghostbusters 3. Story details have leaked out over the years, which puts the focus on Oscar, the lovechild of Dana (Sigourney Weaver) and Peter Venkman (Bill Murray). Oscar reportedly takes over the family business after Murray's Venkman character dies in the first scene. While those details have been around for a while, Aykroyd hints at them when asked about the movie. He had this to say. Seeing Dan Aykroyd mention Bill Murray coming back as a ghost goes back to the leaked treatment for Ghostbusters 3 that has been around for quite a while now. The script is more than likely being rewritten to take out scenes that Harold Ramis would have been in. Additionally, if Murray does agree to star in the sequel, he'll have more parts written in as well, which would be huge for Ghostbusters fans, who have been waiting decades to see the group get together again. The Ghostbusters franchise received the reboot treatment in the all-female version, which was directed by Paul Feige in 2016. The movie was torn apart by fans and critics, who were not happy with the direction of the project. An animated feature has been in the works for a while now as well. Is a Ghostbusters 3 what the franchise really needs at this time? For some, that answer is an obvious yes, while others may be on the fence. Regardless, Dan Aykroyd seems pretty excited about it. While this news is always exciting, Dan Aykroyd has talked about Ghostbusters 3 numerous times over the years. Until Sony makes an announcement, this is nothing more than talk at the moment. However, it would be pretty cool to see the original group together on the big screen again, even if it was in a limited capacity like the original Star Wars cast in the latest trilogy. For now, we'll do what we've done for the last twenty years, which is continue to wait for the studio to make an announcement. You can watch the interview with Dan Aykroyd below, thanks to the Ghostbusters News YouTube channel.